REMEMBER THIS PAGE FROM MY DECEMBER DAILY MINI ALBUM? WERE YOU WONDERING HOW I GOT THIS FULL PAGE OF EMBROIDERED SNOWFLAKES? WELL KEEP SCROLLING AND I'LL GIVE YOU THE FULL DIY! GRAB YOUR FREE DOWNLOAD BY CLICKING THE BUTTON BELOW. IT WILL GIVE YOU A PSD, PDF, AND JPEG VERSION OF THE SNOWFLAKES SHOWN HERE. THIS WILL GIVE YOU THE EXACT REPLICATION OF MY 4" X 4" PAGE. IF YOU HAVE PHOTOSHOP, YOU CAN PUT YOUR IMAGE RIGHT INTO THE TEMPLATE. IF YOU DON'T, SIMPLY PRINT THE TEMPLATE AND PLACE OVER YOUR PICTURE TO PUNCH YOUR EMBROIDERY HOLES. 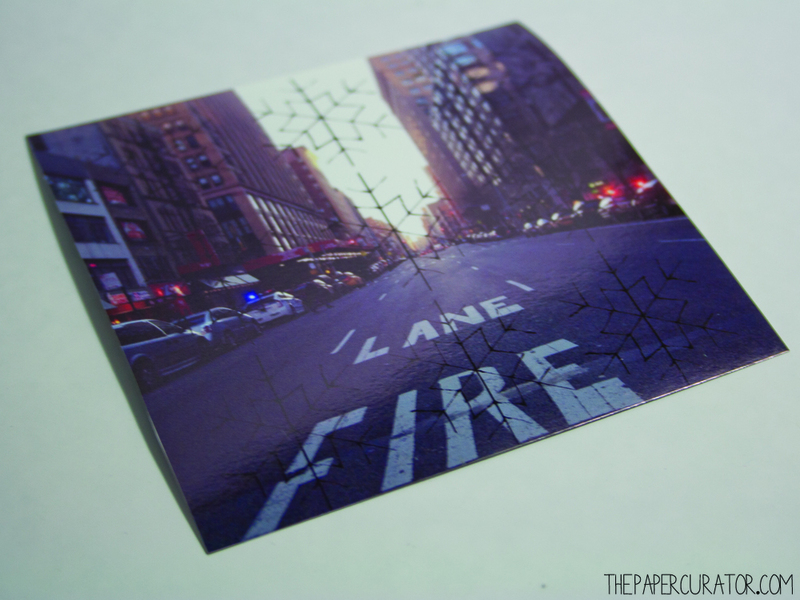 ONCE YOU OPEN YOUR TEMPLATE AND OVERLAY IT WITH YOUR PHOTOGRAPH, YOU'LL PRINT IT OUT. IN PHOTOSHOP, DRAG THE LAYER MASK FROM THE 'YOUR IMAGE HERE' LAYER. PLACE THE MASK ONTO YOUR PHOTO AND YOU'RE READY TO PRINT. IF YOU DON'T HAVE PHOTOSHOP SIMPLY PRINT THE JPEG OF THE TEMPLATE AND PROCEED WITH THE TEMPLATE AND YOUR IMAGE PRINTED SEPARATELY. PLACE YOUR IMAGE FLAT ON YOUR FOAM MAT WITH YOUR CUTTING MAT UNDERNEATH. PROCEED TO PUNCH ALL THE HOLES AND INTERSECTIONS OF EACH SNOWFLAKE WITH YOUR AWL. IF YOU DON'T HAVE THE SNOWFLAKES OVER YOUR IMAGE BUT ARE USING THE PRINT AS A TEMPLATE FOR PUNCHING - YOU WILL ALIGN THE TEMPLATE OVER YOUR PICTURE AND HOLD SECURELY WHILE YOU PUNCH EACH HOLE THROUGH BOTH LAYERS OF IMAGES. FROM THE BACK OF YOUR IMAGE, BEGIN THE FIRST SNOWFLAKE FROM THE CENTER PUNCH WITH YOUR THREAD KNOTTED. OPTIONAL: IF YOU'D LIKE THE FRENCH KNOT INCLUDED IN YOUR SNOWFLAKE YOU'LL NEED TO PUNCH ONE EXTRA HOLE AT THE ENDING OF EACH STAR POINT LIKE THE ONE I PUNCHED HERE. YOU CAN, AT THIS TIME PUNCH EACH EXTRA HOLE IF YOU'D LIKE. FIRST- TAKE NEEDLE FROM BACK THROUGH FRENCH KNOT HOLE. SECOND- PULL THREAD TAUT TO THE SIDE WITH YOUR LEFT HAND. THIRD - INSERT NEEDLE WITH RIGHT HAND FROM THE UNDERSIDE OF YOUR PULLED THREAD. FOURTH - WRAP THREAD THREE TIMES AROUND NEEDLE (THE MORE TIMES YOU WRAP, THE LARGER THE FRENCH KNOT SO # OF WRAPS IS OPTIONAL). FIFTH - KEEPING THREAD TAUT, INSERT NEEDLE BACK IN HOLE YOU BEGAN WITH. PULL NEEDLE THROUGH HOLDING THREAD SO YOUR FRENCH KNOT IS TIGHT. SEVENTH - COMPLETELY PULL THREAD THROUGH AND YOUR FRENCH KNOT WILL BE FORMED. FROM THE ABOVE STEPS YOU SHOULD HAVE THE IDEA ON HOW TO COMPLETE YOUR SNOWFLAKE, SO KEEP EMBROIDERING UNTIL IT'S COMPLETE! REPLICATE SNOWFLAKES UNTIL YOUR PAGE IS COMPLETE. COMPLETED PAGE OF EMBROIDERED SNOWFLAKES | THE PAPER CURATOR.